A chemical substance that goes by the symbol Ne and atomic number 10, most of us know this gas by the name neon and associate it with the bright signs of the world's most futuristic cities. Neon is so linked to the biggest and brightest modern megalopolises of the world that it is surprising to learn that it was in London, hardly the most neon-bright of cities, where the gas was discovered in 1898. Nowadays, neon is fading from all of the cities of the world – being swept aside in favor of the electronic blitz of flashing LED screens. As the lights fade, the art of neon, an art that is highly skilled and dangerous (due to the work of cutting and twisting gas-filled tubes) is becoming more recognized, spurring preservation efforts. With neon lights disappearing from our cities, museums have moved in to preserve the art. For years, the old, disused neon lights of Las Vegas lay abandoned in an old YESCO production lot, known as the "Neon Boneyard," a name that spoke volumes of the fate of Vegas' once glittering lights. The Neon Museum of Las Vegas is restoring those signs and, last fall, opened up its headquarters in the lobby of La Concha Hotel to visitors and started offering hour-long tours of its collection. The Museum of Neon Art similarly works to collect, preserve, and interpret Los Angeles' historic neon signage. In Warsaw, the Neon Muzeum preserves the vibrant neon signs that brightened up the drab Cold War-era streets of Poland. The proliferation of neon during this period in Poland's history was, writes design historian David Crowley, "part of international attempts to reconcile socialism and consumerism...a radiant ‘You are here.'" We love the old neon hotel signs that conjure up images of films noir; think the sickly green neon of the Hotel Empire that washes over the characters in Hitchcock's Vertigo (the hotel is now called Hotel Vertigo and the sign has gone). But perhaps no hotel light was ever as famous as that of the legendary Hotel Chelsea, whose giant neon sign went dark in 2011. While the historic hotels back away from their neon signage, a few modern places are bringing neon features into their exteriors and interiors; even their bedrooms and swimming pools. 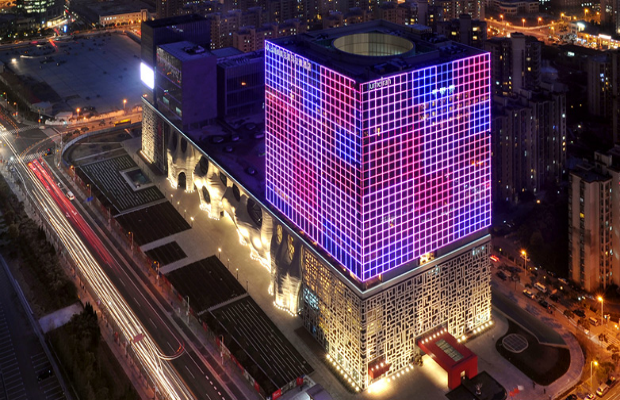 First off, there's the Jumeirah Himalayas Hotel, Shanghai, which is housed in a giant neon cube, and features public spaces that might be described as "Vegas-esque." Hotel Saint Cecilia in Austin, Texas has a swimming pool bathed in the neon glow of a sign that reads "SOUL," and the rooftop bar, pool, and bedrooms of the Reina Roja Hotel in Mexico's Playa Carmen bask in such a red glow, you'd be forgiven for thinking you'd wandered into the red light district. Perhaps most striking, however, is the Sheraton Huzhuo Hot Spring Resort in China, which is shaped like a giant neon-glowing donut. 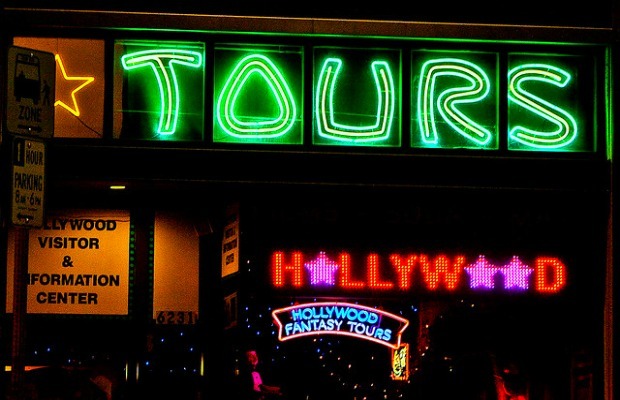 The Los Angeles Museum of Neon Art's "Classic Neon Cruise" made it onto our list of best nighttime tours, but if you want to join the tour, you'll have to move fast as the museum only runs them from June through the end of September (although there is a bonus holiday cruise in December). If you are in New York City, you have several options for plotting your own tour of the city's neon lights – guided by a few neon enthusiasts. The website of Project Neon posts a photo and story of a different notable New York neon sign every week, and has an iPhone app that guides users toward recommended signs across the city. Meanwhile, Thomas Rinaldi, of the New York Neon blog, has published a glossy book of the same name that documents the significance and dwindling number of old neon signs in the city – though, sadly, many of the signs may have disappeared in the time since publication date. Tom Wolfe, back in the 1960s, wrote of Las Vegas in The Kandy-Kolored Tangerine-Flake Streamline Baby as: "the only town in the world whose skyline is made up neither of buildings, like New York, nor of trees, like Wilbraham, Massachusetts, but of signs." Nowadays, the title, if there were one, of most neon-y city would be a hard-fought match between the likes of Shanghai, Tokyo, Osaka, and Hong Kong. We'd call it a tie between the two Japanese cities. When in Tokyo, head to Shinjuku ward (and particularly the small section of Kabukicho, the red light district ) for wall-to-wall neon lights and thousands of tiny bars, clubs, and restaurants crammed into tight buildings – each with its own neon sign. In Osaka, visit the Dotonbori district (above), inspiration for Blade Runner. 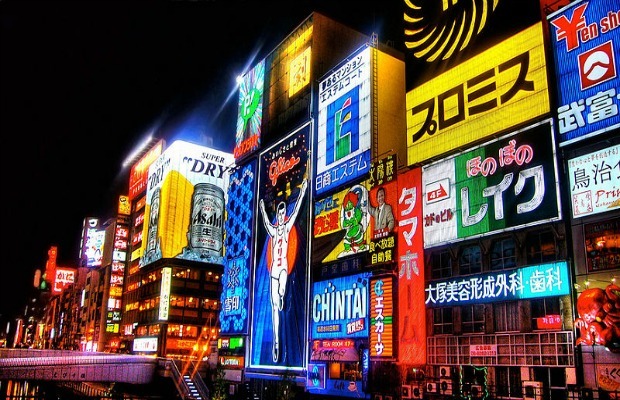 Here you'll find a circus of neon lights, including the most famous, the 1,000-foot-high running man advertising Glico candy, which has been around since 1935.